At only 22 years old, Sabrina Gonzalez Pasterski has accomplished a remarkable amount. At only 14 years old, she stepped into MIT’s campus officers to get approval for a single-engine plane she built. Today, she is an MIT graduate and Harvard Ph.D. candidate with a determination to answer some of the most complex questions in physics. The first-generation Cuban-American woman has already received job offers from Jeff Bezos, the founder of Amazon.com, and aerospace developer and manufacturer Blue Origin. With Pasterski’s focus on exploring black holes and space time, and a specific interest on explaining gravity through the context of quantum mechanics, she is a natural fit for NASA as well. Pasterski has received remarkable feedback from experts, who first noticed the young girl after watching a video of her build her single-engine airplane. “Our mouths were hanging open after we looked at it,” MIT Professors Allen Haggerty and Earll Murman told Yahoo. This praise has been echoed by her professor at Harvard, Andrew Strominger, who is publishing a paper with Stephen Hawking. 2. She has never had a boyfriend, smoked a cigarette or tried alcohol. 3. She was waitlisted when she first applied to 2011. At her graduation, she had earned a 5.00 GPA, the highest possible marking. 4. She does not own a smartphone and avoids social media. 5. She is still online—operating her own website and YouTube accounts. “I TOLD you, Daddy, I told you,” Sabrina Pasterski shouted excitedly before her father wrapped her up in an embrace. “Oh my God, it’s so amazing,” she said, then she broke into a short jig. Sabrina, then aged just 13, had reason to celebrate. It was 2006 and the young Chicago native has just reached a milestone. While other barely teens are playing video games and sleeping in, Sabrina is laying the final touches on a single-engine aircraft she had built from scratch in a workshop in her father’s garage. “It’s amazing, it just starts spinning. It’s awesome,” she said after the first test of the engine, one that took her 363 days to finish. The plane was a sign of things to come. Fast-forward nine years and the now-22-year-old is being held up as a the “new Einstein”, a young woman whose brain works in ways few have ever worked and whose future is limitless. She regularly features in Forbes’ 30 under 30 list and she graduated from one of the world’s most prestigious schools with the highest score possible. If you haven’t heard of her, you’re not alone. But the world will soon know her name. 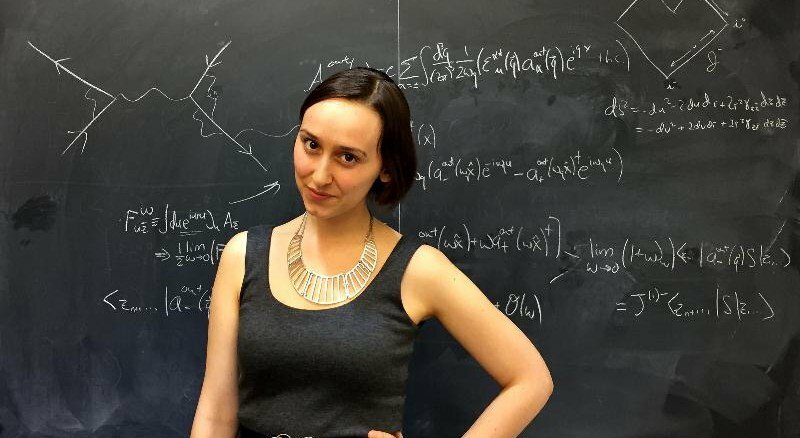 The Massachusetts Institute of Technology (MIT) graduate is next in line — behind Stephen Hawking and Albert Einstein — to take the mantle as the world’s most talented thinker. Ms Pasterski has already graduated from MIT with a perfect grade point average of 5.00. She’s now studying for her doctorate at another school you may have heard of: Harvard. When she graduates, she’ll likely be able to work wherever she pleases. Jeff Bezos, aerospace developer and founder of Amazon.com, has extended an open invitation for Ms Pasterski to join him whenever she likes. NASA is reportedly also interested in recruiting her. After building a plane, she could be forgiven for resting on her already impressive achievements. But she said she knows she has to constantly reinvent herself, a lesson she learnt the hard way when she was a high school student. Ms Pasterski has moved on from building planes but said it helped her understand physics in a tangible way. Her next project could help us understand the universe. At Harvard, she is researching black holes, gravity and space-time, areas of study tackled by Einstein and Hawking before her. “Years of pushing the bounds of what I could achieve led me to physics,” she said in an interview published this week. She said she liked “spotting elegance within the chaos”. Her fascination with space started when she was a young girl. She attended the Chicago Public Schools’ Edison Regional Gifted Center and, told reporters at the Chicago Tribune, she decided she wanted to send someone to Mars. Her website is full of achievements, including a feature in Scientific American where she declared that in 10 years she would be: “On the cover of Scientific American”. That result wouldn’t surprise anyone who knows her. The plane, which she flew solo above Lake Michigan as a teenager, got her closer to space than she’d ever been. She said these days she hopes to push herself even higher. “I’m harder on myself than other people probably are on me,” she told the Tribune. She said “fingers crossed” like she’s depending on luck to intervene. But you don’t need luck when you have good science. These days, achievements like speaking at the same event as former Secretary of State Colin Powell or researching spaceflight at NASA come up almost as an afterthought. Her website includes a long roster of her accomplishments. The down-to-earth Pasterski, a first-generation Cuban-American, talked to us about successes, setbacks … and chocolate. Following is an edited transcript. A: When I was little, I was interested in aerospace. I wanted to build spacecraft. I was never that into sci-fi as much, because there’s so much science fact that’s so interesting. But I think science fairs probably started some of it. Q: Tell me about the first time you went up in a plane, at 9 years old. A: The first time was a discovery flight (which typically includes both instruction and a quick time in the air with a flight instructor). It was basically along the shoreline. That was really gorgeous. It’s a nice feeling. It gives you a different perspective; everything’s so much smaller. Q: After many early achievements, you were wait-listed at MIT and initially didn’t get into Harvard. After a string of successes, that must have been tough. What did you learn from that experience? A: It was an interesting experience because it might have actually pushed me a little bit to re-evaluate where I wanted to be. (It) was a bit of a blow. At some level, I’m glad that I didn’t (apply to more schools), because if I had a safety school, I don’t know if I could have pushed myself in off the wait list. Q: It’s not the setback; it’s the reaction? A: For now, it’s just focusing on getting my Ph.D. I want to eventually found and run an interdisciplinary laboratory. The way I see it is, biology relies upon chemistry, chemistry relies upon physics, and in some level when you can reduce things to simpler ideas, you have a lot more power to use them. It’s good to have a bigger picture and see where you can actually go and not end up getting caught in some particular lab or a section of a company doing a particular task. In that regard, your contribution is limited to where you’re at. A: Chocolate. I don’t really drink caffeine, so that’s the closest thing. Q: Do you have a favorite Chicago summer activity when you’re home from school? A: Whether it’s summer or not, I do enjoy listening to the radio, driving my family downtown. We live in Edison Park; it’s a wonderful (neighborhood), but it’s not big city. It’s fun to appreciate the city and maybe daydream a little bit. Q: Many things that other people might have seen as intimidating, from getting into Harvard to flying a plane as a teenager, didn’t dissuade you. Is there a good way to approach things that seem so daunting? A: Oftentimes in retrospect, the thing that’s the hardest or perceived to be are the things you end up being most proud of. If you keep that in mind, the fact that you went through it, or made it turn out the better for yourself as much as you could, makes something that you are then happy to talk about. The attitude is to take into account: How will you see this a few years down the line? A: My parents have always been encouraging. (They) never really said anything was impossible. Maybe I might still be on the edge of thinking that nothing is impossible. The more you learn, the more you realize what exactly people think is impossible, and then you see where you can push a line. It’s important to encourage your children. Everybody has something that they’re good at, and you (shouldn’t) force people to go through the standard route. Q: How do you handle the pressure of people expecting great things from you, based on what you’ve already achieved? A: I’m harder on myself than other people probably are on me. I definitely feel like I have way more to do. It’s great to get recognition now, but hopefully it builds up to something. I’ll hopefully be right about having some kind of gut feeling that (will become) rather big at some point. Fingers crossed.